While we appreciate DPI’s concerns with a possible shortage of teacher candidates in some subject and geographical areas, we feel it is important to maintain teacher quality standards while moving to expand pathways to teaching. Statute section 118.19(14) currently requires new K-5 teachers, reading teachers, reading specialists, and special education teachers to pass the Wisconsin Foundations of Reading Test (WI-FORT) before getting an initial license to teach. The intent of this statute, passed in 2012 on a bipartisan vote following a recommendation of the non-partisan Read to Lead task force, was to enhance teacher quality by encouraging robust reading courses in educator preparation programs, and to ensure that beginning and struggling readers had an effective teacher. The WI-FORT is the same test given in Massachusetts, which has the highest 4th grade reading performance in the country. It covers basic content knowledge and application skills in the five components of foundational reading that are necessary for successfully teaching all students. The annual state Forward exam and the newly-released results of the 2017 National Assessment of Educational Progress (NAEP) highlight the importance of having high-quality teachers in Wisconsin classrooms. 65% of our 4th graders were not proficient in reading on the NAEP. Our national ranking has slipped to 34th, and all sub-groups of students perform below their national averages. Our black students rank 49th among black students in the country, and our white students rank 41st. The revised teacher licensure rules that DPI has presented to the legislature in the re-written administrative rule PI 34, create a new Tier I license that provides broad exemptions from the WI- FORT. We encourage the education committees to table the adoption of this permanent rule until it is amended to better support teacher quality standards and align with the intent of statute 118.19(14). We favor limiting the instances where the WI-FORT is waived to those in which a district proves it cannot find a fully-qualified teacher to hire, and limiting the duration of those licenses to one year, with reading taught under the supervision of an individual who has passed the WI-FORT. Renewals should not be permitted except in case of proven emergency. We favor having DPI set out standards for reading instruction in educator preparation programs that encompass both the Standards for Reading Professionals (International Literacy Association) and the Knowledge and Practice Standards for Teachers of Reading (International Dyslexia Association). This will enable aspiring teachers to pass the WI-FORT and enter the classroom prepared to teach reading. We favor having DPI implement a corrective action plan for educator preparation programs where fewer than 85% of students pass the WI-FORT on the first attempt in any year. Students putting in four years of tuition and effort should be able to expect to pass the WI-FORT. 34.028 (2) (a) and (c) will allow an in-state or out-of-state graduate of an educator preparation program to become a teacher of record, with full responsibility for students, under a Tier I license without passing the WI- FORT. An employing district need not show a lack of fully-qualified applicants for the position. The Tier I license is granted for one year, but then may be renewed indefinitely under 34.028 (4) (a) and (b) through a combination of teacher and district request without the teacher ever passing the WI-FORT. 34.028 (2) (d) will grant a Tier I license to any graduate of an accredited college or university without passing the WI-FORT if an employing school district conducts a search for a full-licensed candidate, but cannot find an acceptable candidate. This is the “emergency” situation of teacher shortage under which a Tier I license might be justified, provided the district conducts a thorough search and explains why any fully-licensed candidates were not acceptable. This Tier I license is also granted for one year, but then may be renewed indefinitely under 34.028 (4) (c) without the teacher passing the WI-FORT and without any further requirement that the district seek a fully-licensed teacher. 34.029 essentially allows districts to train their existing teachers (licensed under Tier I, II, III, or IV) for a new position not covered by their current license. The teacher is granted a Tier I license in the new subject or developmental level, and training consists of whatever professional development and supervision the district deems necessary. These teachers do not need to pass the WI-FORT, either at the beginning or conclusion of their training, even if their new position would otherwise require it. The district need not show that it cannot find a fully-licensed teacher for the position. This license is granted for three years, at which point the district may request a jump-up to a lifetime Tier III license for the teacher in this new position. District training programs may be as effective as traditional preparation programs in teaching reading content, but without the teachers taking the WI-FORT, there is no way to objectively know the level of their expertise. *There are currently over 358,000 K-5 students in Wisconsin public schools alone. 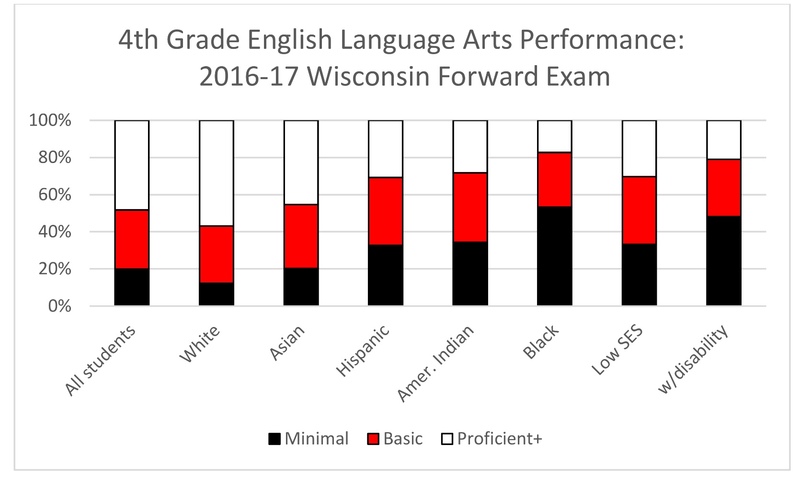 51.7% of Wisconsin 4th graders were not proficient in reading on the 2016-17 state Forward exam. 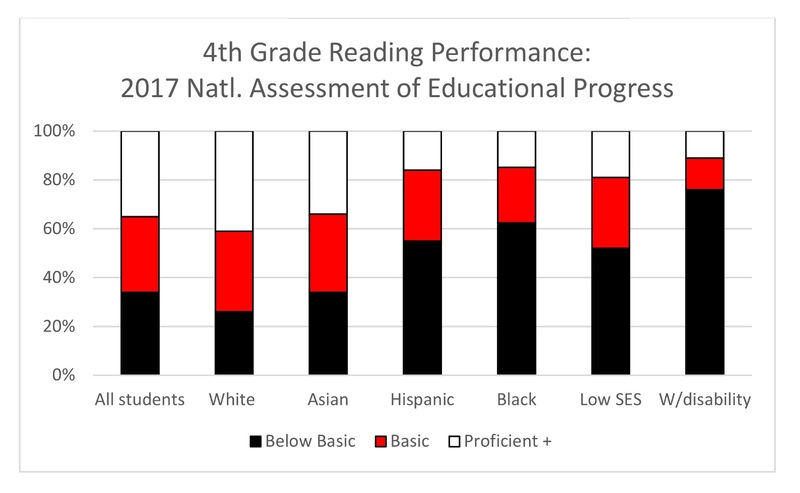 Non-proficient percentages varied among student sub-groups, as shown below in red and black, and ranged from approximately 70-80% in the lower-performing districts to 20-35% in higher-performing districts. 65% of Wisconsin 4th graders were not proficient on the 2017 National Assessment of Educational Progress. Non- proficient percentages varied among student sub-groups, as shown below in red and black, and all shown sub-groups performed below the national averages for those sub-groups. Black students in Wisconsin were the 3rd lowest-performing African-American cohort in the country (besting only Iowa and Maine), and Wisconsin had the 5th largest black-white performance gap (tied with California and behind Washington, D.C., Iowa, Minnesota, and Illinois). Wisconsin posts lowest ever NAEP Reading score in 2017. Long time Wisconsin DPI Superintendent Tony Evers is currently running for Governor.